More than two dozen police officers were hurt in Belfast, Northern Ireland on Saturday in more battles over restrictions on flying the Union flag. The officers were trying to separate Irish nationalists who fought with British loyalists returning from a demonstration in the city centre to the Protestant east side. A group of mostly hooded men and youths waited by their doors in the Catholic enclave called Short Strand, armed with bats, golf clubs and other makeshift weapons and the opposing sides began throwing objects. Police separated the two groups and fired several plastic bullets, before loyalists turned on the police and threw stones and bottles at them. Officers had to intervene in a second round of street fighting after nightfall. 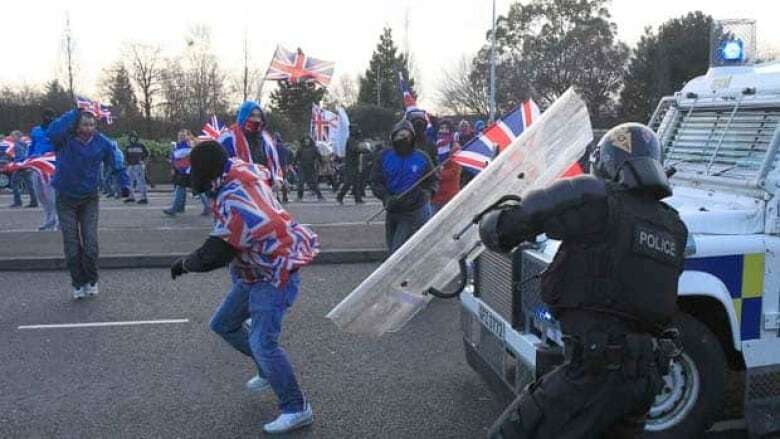 The Protestants have blocked streets daily since Catholics on city council voted on Dec. 3 to limit the flying of the British flag, commonly known as the Union Jack, to 18 designated days above the town hall. Previously, the flag had been raised every day, year-round. Police commander Mark Baggott said 29 of his officers were injured in the two operations, bringing total police casualties above 100 since the first riots outside city hall last month. The violence is reported to have cost Northern Ireland an estimated £25 million ($40 million) in lost trade and tourism and in police overtime bills. The Irish nationalist Sinn Fein party said 10 Short Strand homes were damaged during Saturday's clashes. Sinn Fein councillor Niall Ó Donnghaile, who represents Short Strand, said it was the 15th illegal Protestant march past the Catholic neighbourhood since last month.